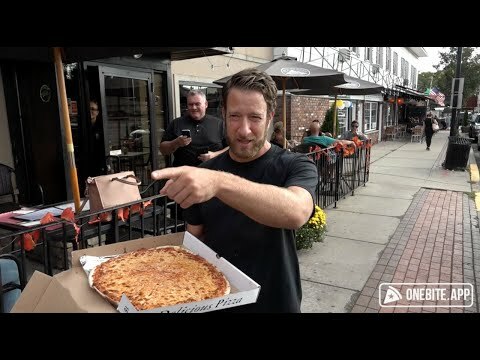 Barstool Sports CEO Dave Portnoy is back in Bergen County. Less than one week after visiting Kinchley's Tavern in Ramsey -- where he said the pie was not crispy enough -- the sports blogger visited New Park Tavern in East Rutherford for his "One Bite" pizza review series. Portnoy on Saturday said the pie was a little too big to be bar-style, but liked that the bottom was crispy -- he noted, more so than Kinchley's. "I can work with this," Portnoy said in front of a crowd that had gathered outside. "You can hear the crunch all the way to Nebraska. "It has the right crisp... Love the texture... but the sauce could have a little more tang for me." Portnoy rated the pie a "fair" 7.8... and the crowd went wild. He joked that the turnout was so good that he should return to East Rutherford to be the king. New Park Tavern owner Nick Italiano says what makes his shop's pizza unique is that they've had the same recipe for more than eight decades. "All our pizza is thin crust, crispy and has the perfect cheese to sauce ratio," he said. New Park Tavern opened 85 years ago on Valentine's Day. Over the years, the restaurant grew larger into what it is today. Italiano said the pizzeria has the largest circular bar in New Jersey. "We are so honored Dave chose to come and try our pizza," he said. "We’ve been wanting him to come for months. We think our pizza is a 10, but we know he’s a tough critic so we’re okay with a 7.8 from him. He did say it was very good and he liked it a lot. Overall, We’re happy with his review. We won’t be changing our pizza though, too many customers would be disappointed."